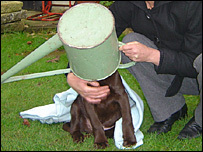 A three-month-old puppy had to be rescued after he got his head stuck in a metal watering can. Ted, a chocolate Labrador, got himself trapped in the can while playing in a back garden on Wednesday afternoon. Hampshire fire service's specialist animal rescue team was brought in to release Ted. They had to cut away the watering can using bolt cutters, after initial attempts to free Ted using a hacksaw blade failed. Anton Phillips, watch manager, said: "The watering can fitted like a glove around Ted's head and great care had to be taken to keep the pet calm. "Thankfully we were able to swiftly release Ted's head and he bounded away safely from his ordeal with no ill effects."